With the start of the new year only a mere two weeks ago, Google is already hitting the ground running with their latest updates for their Google Manufacturer Center. These new options will give businesses more control over their product’s search results, as well as better evaluate their Google performance. Originally released in 2015, the Manufacturer Center allows businesses to upload relevant product information, which is shown to users on the search results page. The most significant new tool allows businesses the opportunity to add their own, custom product information to appear in product-specific queries. While the change may not seem as drastic as one might think, businesses will now have full power over what their potential customers will be able to see in the search results. The new feature will be shown in a separate panel added to the search result listings, titled “From the Manufacturer.” Within this panel, businesses will be able to share blog posts, extended product descriptions, as well as additional photos and videos. This enhanced level of information will serve to augment search results by offering customers the most up-to-date and extensive details about products and services. The new panel will also help businesses build personal connections with their customers by allowing companies the opportunity to be completely transparent with product data and showing appreciation for their customer’s time, which allows businesses the chance to stand out from the competition. 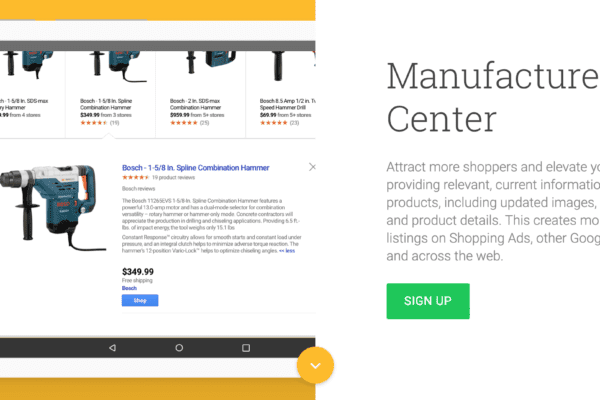 In addition to improving search results, Google has also released three new tools, all of which work to improve analytics within the Manufacturer Center. The first new feature includes performance trends concerning high performance product groups and significant price changes. Secondly, analytics will now provide insights on product search keywords and price trends. Lastly, product group statistics will serve to show which competitor brands and products are listed alongside your business search results. These new features will allow businesses the means to understanding how their product advertisements are performing. After evaluating their best performing products and price trends, and learning key search terms and competition, businesses are able to accurately adjust their Google ads in order to maximize online visibility and boost customer appeal. For instance, businesses can gain insights on the prevalent keywords and terms used to search for their products. Then, those businesses can submit product descriptions which contain those keywords in order to optimize their product’s search results. Another new facility of Google’s Manufacturer Center provides an interactive search element that was previously missing. Customers now have the option to “follow” businesses directly from the Manufacturer Center page. The new “follow” tab enables users to receive notifications about events, offer, and other updates from the business. If you would like more information about Google Manufacturer Center, need help reaping the benefits of these changes, or other digital marketing services please contact Pink Dog Digital at (410) 696-3305, email us at info@pinkdogdigital.com, or visit us on the web at www.pinkdogdigital.com.